If you are not using Internet Explorer, please ignore these instructions. All other web browsers such as Google Chrome or Firefox will work without any adjustment. 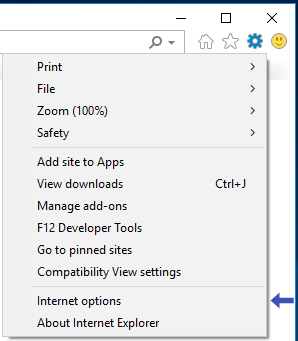 From Internet Explorer, select the "Internet Options" menu item from the "Tools" menu in the upper-right corner the window. This menu may be displayed as a Gear icon. See screen shot below for what to look for. The Internet Options Dialog will appear. Click on the "Security" tab, which is the second tab on the top. Verify that Enable Protected Mode is NOT selected. Click on the "Sites" button. 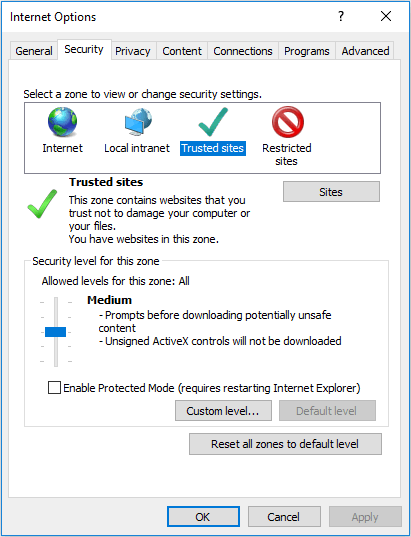 The "Trusted Sites" Dialog Box will appear. Make sure that the checkbox "Require server verification for all sites in this zone" is NOT checked. Type in *.realtyjuggler.com to the "Add this website to the zone:" field and Click on the "Add" button to add *.realtyjuggler.com as a trusted site. If you get an error "Sites added to this zone must use the https: prefix", uncheck the "Require server verification for all sites in this zone" check-box at the bottom of the window, and try again. Double check that the URL in the websites list is exactly *.realtyjuggler.com. YOU MUST HAVE EXACTLY *.realtyjuggler.com. If you see anything but *.realtyjuggler.com such as: www, http, or https then you need to remove that item and re-enter the address again; this time typing in: *.realtyjuggler.com. Please look at the screen shot above to see the exact spelling required. If the "security level for this zone" is not Medium, click on the "Default Level" button to make it medium. Click "OK" Button. Restart your computer. Click on this link for a video tutorial showing how to adjust your security settings.